OMG Posters! 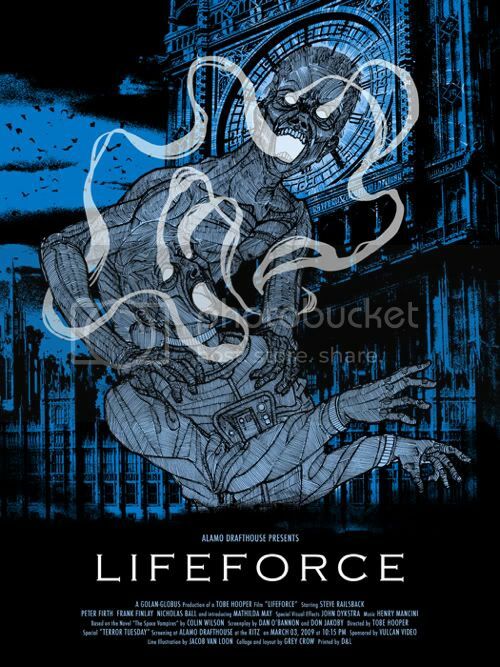 » Archive Lifeforce Poster by Jacob Van Loon - OMG Posters! Damn, this thing is great. Jacob Van Loon pretty much nailed this poster for an Alamo Drafthouse screening of everyone’s favorite movie about vampires in space, Lifeforce. He did the main illustration, while the layout and collage were done by Grey Crow (something tells me that’s an alias, very mysterious). This one is a 19″ x 25.5″ screenprint, and it was printed with blue glow in the dark ink. Pick one up for $25 at Mondotees.com. i’ve never heard of this movie, i’m going to netflix it.